Non-uniform continuous precipitation of the β-phase is known to occur within the solution-treated grains of AZ91 alloys during aging. In the present study, the segregation profiles of solute elements in the as-cast, solution heat-treated, and aged specimens of AZ91E were examined by electron probe micro analysis. The results were correlated with optical and SEM observations of the microstructures. 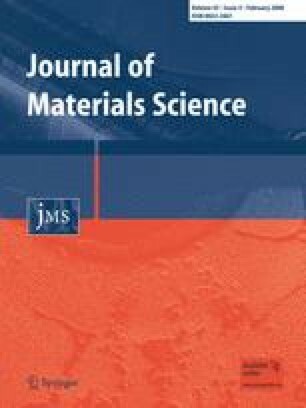 It was found that the dendrite cores of the cast structure were richer in manganese concentration and these manganese-rich regions remained unchanged even after solution heat-treatment for 24 h at 410 °C, while the segregated aluminum and zinc in the interdendritic regions of the cast structure diffused homogeneously into the matrix grains. It was also found that the regions of grains that were richer in manganese were a source of preferential nucleation for β-precipitates. Thus, the cause of the non-uniform distribution of β-phase precipitates during aging is attributed to the solute segregation of manganese during solidification. The financial support provided under the Promotion of Interactive Research Projects by the Ministry of Education, Culture, Sports, Science and Technology of Japan is gratefully acknowledged. Appreciation is also expressed to the Natural Sciences and Engineering Research Council of Canada for their support.